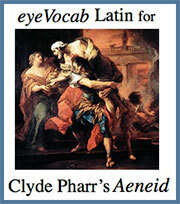 This implementation of eyeVocab Latin covers the high frequency vocabulary, 292 words, from the pullout in Clyde Pharr's Vergil's Aeneid: Books I-VI. Far more than a set of electronic flashcards, the multimodal vocabulary program facilitates a significantly deeper learning and retention. Students will readily master the frequent Vergil vocabulary thereby devote far more of their study time and energy to reading and discussing the Aeneid.